A wealth tax would not be good for the U.S. economy. In his book, Capital in the 21st Century, Thomas Piketty suggests a wealth tax to fight income inequality. In a recent report, we used our Taxes and Growth model to evaluate the impact of such a tax on the U.S. economy. Piketty suggests a couple variations on a wealth tax with different rates starting a various income levels. One suggestion would create a 1 percent tax on net wealth between 1 and 5 million euros ($1.3 to $6.5 million) and a 2 percent tax on income over 5 million euros ($6.5 million). He also mentions a tax on “modest to average wealth” with a 0.5 percent tax rate on net wealth between 200,000 and 1 million euros ($260,000 to $1.3 million). Our model estimates that this tax would have a significant negative impact on the economy. 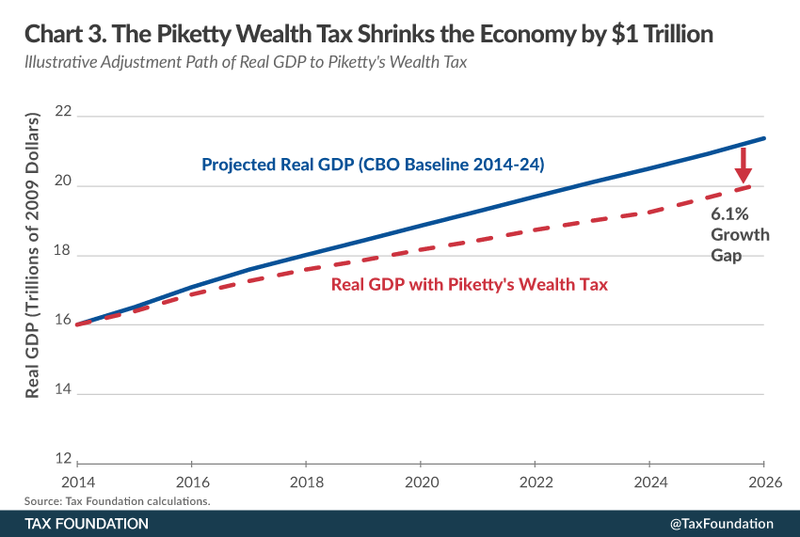 The Piketty wealth tax would shrink the economy by close to $1 trillion in total size (down 6.1 percent), decrease wages by 5.2 percent and total investment would drop by over 16 percent. Additionally, it would eliminate 1.1 million jobs. Overall, the tax would reduce after-tax income by 9.2 percent and, while the top 1 percent would see their incomes drop 13.2 percent, the bottom 20 percent would also see they income drop 7.3 percent. In the end, Piketty’s wealth tax—in pursuit of reducing income inequality—would make everyone worse off due to decreased economic activity. In a previous paper we evaluated the effect of Piketty’s 80 percent tax rate on wage and investment income and found that it would shrink the economy by nearly $3 trillion.